The Life of Bon: LEER. It means read in spanish and brush up on your Spanish already. LEER. It means read in spanish and brush up on your Spanish already. I used to think it was just my students. My first year teaching I was appalled by how many students wouldn't read the assigned chapters. I threatened them with quizzes, discussion points, tests that went on for days. But to no avail. Students would rather just take a lower than sit down and read a couple of chapters. I've accepted the fact that not all of my 17 year old hood rats will be dying to engage in a rip roaring conversation about To Kill a Mockingbird. I'm still coping with this knowledge, bit overall I thought I have been handling well with my minions of book-hating teenagers. But then a couple of things really struck a nerve for me. The first thing happened at parent teacher conference. A mom came in with her son in tote. As we visited, she explained to me that her son didn't like reading. I said I understood. Then she said, "What can he do to pass the class without having to read the books?" My jaw hit the floor. Without reading the books? You want me to pass your son but not make him do any of the required reading for a reading class? Would this woman have the audacity to ask for a passing grade in math without solving the problems or a passing grade in science without doing the labs? Then how was it that she had the nerve to ask for her son's passing grade in a reading class without requiring him to read? I was so upset with the mother I almost couldn't continue the conference. Instead of pushing her son to reach the expectations that were put in front of him, she was lowering the expectation so he wouldn't have to strain too hard to get it. Instead of saying, "I know it might not be your favorite thing, but reading has immense value and you need to sit down and just power through those chapters" she was saying, "Oh this isn't fun for you? Okay, you can stop." "Oh you don't like something that's hard? Go ahead and quit then. It's not important anyway." The second incident happened in the faculty room during lunch. I was trying to ask the teachers if any of them were coming to the faculty book club that week. The book club at our school has two notoriously faithful members- me and the 85 year old librarian. Let's just say it can be quite boring with just us two. Hence, I'm forever trying to recruit. "So who's coming to book club this week?" I asked excitedly to the teachers gathered around the tables, eating their tuna fish sandwiches and complaining about kids that never hand work in,. There was a brief awkward silence and then someone spoke up. "What?" I was flabbergasted. From a teacher? "What do you mean you don't read?" I questioned. "I don't read. I think it's boring. There are so many things I would rather do than read." And then from another teacher. "Yah, me neither. Plus the librarian gives me the creeps." I didn't say much more after that. I was afraid if I did I would be extremely rude and condescending. But I couldn't help but be a little embarrassed for these teachers. And honestly a little infuriated. 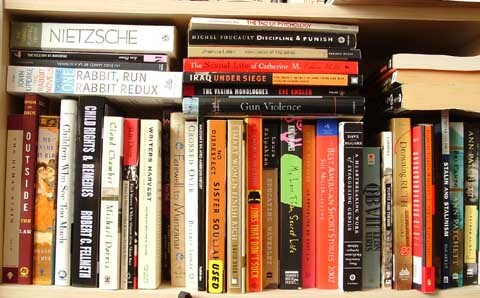 How was it that the teachers of our public schools, our educators of all people, were telling me that they didn't read? And if the teachers of America aren't even reading books than how the hell am I supposed to convince the students of its importance? I look at my students and the hopped up world that they are apart of and I can't help but understand why they struggle to sit down and read. Social media is so visual and so much about instant gratification. Books, on the other hand, require focus and commitment and patience. I wonder what Instagram is teaching us- that the picture is more important than the words? I wonder what Twitter is teaching us- that if you can't say something in less than 140 characters, it's not worth saying at all? And then I understand why my students don't have the attention to read two chapters a night. So what say ye fellow bloggers? Do you like to read? How often do you read? Does reading fiction still have a place in our society? Or am I just some old grandma trying to hold on to once was? Trying too hard to push my old world onto the ever changing ways of the new world? Well, I'm biased. I read all the time. I email Matt at least once a day with a new article or blog that I read that I want to discuss with him later. Tonight, we talked about Hamlet, and earlier this week The Stranger. Honestly, after putting a lot of thought into this, I don't think it's the kids' faults. I think it's their parents. If the parents don't/can't appreciate reading, how can they teach their kids to? How many parents take their kids to the library still? Or better yet a small second hand bookstore with the promise that they can pick one book to buy and bring home? I'm taking Art History right now. Neither of my parents taught me about art. I have never been able to appreciate it, until I had someone to show me what to look for and love. I think the same principle goes for books. I bet you a million bucks that that student's mother doesn't like to read. And poor you had to see the sad consequences of it -- a child who hates reading. I love reading. I am one who thinks that books are better then their movie counterparts 98% of the time. I have been dying to join a book club, and I finally did this year. Since I am really busy with school and work I probably only read 1 or 2 books a month. This whole post just made me really sad, especially about your fellow teachers. I agree with Michele. I grew up with two parents who read all the time, so even before I was old enough to read, I was reading magazines upside down. I grew up with both of my parents reading to me constantly. I used to (and still do!) read all the time. I didn't go play outside enough because I just wanted to read. Yep, I was one of those kids. My husband, on the other hand, grew up with parents who don't read much. They didn't read to him much growing up, and just let him spend all of his time at home playing video games. He still isn't a fan of reading, and the only time you'll catch him reading is when it's on ESPN. It's not that he's a slow reader, he just doesn't think it's fun. I just did a post about my love of reading! When it comes to school and reading, I think a lot of it has to do with the fact that no one likes reading something when they're forced to do it. I think back to my university days where I was required to read and sometimes, it wouldn't have mattered how good the literature was, if someone was telling me I had to read it and it had to be done by a certain time, I resented it. My (past) students loved to read. They would beg me for more time to read and often times an hour would slip by. We also spent a lot of time learning how to choose books that suit our interests. I love historical fiction and books about other cultures but not everyone does. Give me a book about sports and chances are I won't be running home to read it. Some kids will devour a newspaper because they want to know about what is happening now while others will be engrossed in science fiction. You should check out E Tells Tales' blog - she is teaching high school English and has some super cool ideas. I read whenever I have a free minute. I've always got a book tucked away in my bag whenever I step out. My husband and I are both avid readers. In fact, our two bedroom apartment is stuffed with bookcases. Three floor to ceiling bookcases in the living area and one smaller one in each bedroom. We need another one. Not to mention the 100 something ebook titles we own. I can't imagine not reading. We are both trying to set the example that reading rocks to our toddler. My heart goes out to you. I can't imagine not reading. I'm constantly devouring books. Actually, my mom told me when I was a little girl I'd actually nibble on them. Oh! Don't you think it would be fun to have a virtual book club in the blog world? Great post... your passion for reading and literature is obvious. HOWEVER, I don't think that reading is the complete embodiment of learning as a whole. It is just one way that people can learn about the world around them... there are many other methods of learning... some people are more hands on, others are visual learners. So, just because English isn't your student's favorite subject, don't discount them. I made that mistake when I taught history and was too tough on some of my students. I thought everyone should love and appreciate history. One kid I was particularly hard on... he slept in my class each day, and I was always on his case. Then I learned his favorite class was metal shop. I was told he did amazing things with his hands... and he wanted to work on cars for a living. So, that doesn't mean that he's an ignorant ingrate, it just means he has other interests. He couldn't tell me the specificities of the Revolutionary War, but he sure as heck knew a lot more about cars and how to fix them than I ever will know. Keep encouraging them, just be accepting of other peoples passions and interests. Your passion isn't superior to theirs . And remember that these teenagers' brains haven't fully developed... they may not have found their niche yet, and you are exposing them to a wonderful world of literature many have never been shown before. They will remember how much you cared about books and may show a lot more interest in reading and/or literature as they grow into maturity. And even if they don't, that's ok too. I guess I should preface my answer with the fact that I am the daughter of, not one but, two English teachers and I was a primary school teacher a few years ago. I love to read. I always have a book or six on the go. I do not like to go to sleep without squeezing in a chapter or two of whatever I am reading. I did well in English at school but I loathed it and did not take a single English paper at Uni. I felt the level of analysis we did on some wonderful books totally sucked the joy from them. I had passionate teachers and those marking time but the love of the language was removed by the emphasis on themes and such. My daughter loves to be read to and now retells us her favourite stories at bedtime. It has been such fun introducing her to our favourite books from childhood. Hang in there! If you encourage one child every year to embrace reading then you will change not just that individual but their future family. I love reading, but now that I'm back in school, I don't read nearly as much as I want to. I've never quite understood why people didn't like to read. Sure, not all books are going to be something that you enjoy, but there has to be SOMETHING that you do out there. To Kill a Mockingbird is an awesome book. and that mother is setting her son up to fail. I'm just sayin. I love to read! I've been reading anything and everything I could, including cereal boxes and grocery store flyers, since I was 4. Currently I'm in beauty school and I read books on my lunch break while my classmates text. But I sure hope reading doesn't go out of style because I desire to make my living by my pen. :P Oh well, good thing the husband's in the medical field. I absolutely LOVE reading. I was the shy kid that was always reading a book in the corner of the classroom. I learned to read in pre-school, and was hated by my first grade classmates because our teacher had me help THEM learn how to read. I've probably spent thousands of dollars buying books, both paper and digital. I for one don't understand how people DON'T enjoy reading. For me, it's an escape. It keeps my mind sharp and I learn so many random things and new words. However, I can understand students not wanting to read for school. I wish they knew that the books you are asking them to read are FUN reads. Not dull like a textbook. I think reading is important. I enjoy it. But I don't read often, and in fact I would agree that there are various other things I'd rather do than read. However, I think there is a bigger message in all of this. Sometimes in life you have to do things you don't want to do. Not just do them to get by, but do them to learn, understand, and grow. I think a lot of parents are like the one you met. They'd rather take the easy way out, so they also think their kids should take the easy way out. But that doesn't build character, that doesn't teach you anything. In my opinion, you shouldn't back down. You don't have to make them loveeeee reading like you do, but you do need to make them handle their responsibilities. Just because you don't like something doesn't mean you don't have to do it. They're old enough, they need to see the bigger picture in all of this. I can honestly say I was NEVER a reader, and it took a lot to get me to read it would have to be something that I was interested in or reading would put me to sleep. However within the last 2 years I have found a new appreciation for reading (thank you mr. grey!) and I have started reading, I can tell you for pleasure prior to about 2 years ago I was lucky if I had read 2 books since high school. I just got a kindle fire and I am reading like crazy! I have found a new love for reading and maybe there are more books out there now that won't put me to sleep and that I'm interested in reading but I actually enjoy it now. However had you asked me in high school I would have been like read, what, seriously, no thanks. As a former high school teacher, that parent's attitude is widespread and not just about reading. That is what bothers me the most. Parents siding with their child that just because they are getting A's in math and science I must be doing something wrong by giving them a B, by expecting them to put effort into such a silly subject as interior design or fashion. But don't stop trying! I would just have them do more of the reading in class, out loud, all together. Maybe every day until they realize your other lessons were more fun if the only they did the reading at home! Someone already mentioned Elizabeth, she's great. She posts her weekly updates about the English classes she teaches. Her blog is etellstales.com. If nothing else, doesn't this teach you the kind of mom you want to be someday?!?! WHAT?????? The TEACHERS won't read? What? What? What? I think I just had a heart attack. I know that when I was in school I was the nerd who actually liked the books. I understand this. MAYBE 1/2 of my class would read the book. I get that. But COME ON. This is a LITERATURE or ENGLISH class. READING THE BOOK IS THE POINT!!!!! Ugh I just... I can't handle this. My brain just can't process it. Love, love to read here! I hate it when I don't have time, and I often don't, but reading is my favorite thing to do. Have you tried any graphic novels with your students? Working in a library, I found that a lot of kids were far more interested in those than in regular books. There are some adaptations of classic lit, too, which might be useful. Keep trying! It might take a long time for some kids, but if you keep trying, they're more likely to find a book or story that makes it all click for them. I hear yuh! There is nothing like a good book. I agree with everything you said. I loved to read when I was younger. Then it wasn't cool. Then I went to college and all I read was text books, which isn't cool. Now that I have a little bit of free time. I read. A lot. I'm sorry your students don't read, but if that's the attitude of your fellow teachers, it's no surprise. My middle school has the highest rates of library checking out (or something like that) and most of our students are big readers. As teachers we have to put "look what I'm reading" signs up in our rooms and talk about the books on them to our classes. Also our English teachers don't assign novels as a class, but allow students to choose their own books. I think that is a huge help at our school. I LOVE reading so I can't understand people who don't. However, I think that if the parents are not very educated tehn of course their children won't like to read. That's so sad! I cannot believe that mother! Ridiculous! To be fair... I didn't love reading until a few years ago. In highschool, I hated reading all the assigned books and having to annotate and find the 'hidden meaning.' So I just didn't love reading. But now that I am finished with all my schooling- there is nothing better than a god book! Reading has always been and will always be my favorite thing in the whole world! My dad was a librarian for a large portion of my life so I practically grew up in a library. My sister is the complete opposite. However, I've found that anyone can learn to love reading, you just have to find them a book that will catch and hold their interest. . .even if it's initially fluff. Oh and I absolutely can't believe that a parent asked you how her kid could pass the class without reading?! What is that parent teaching her child?! Holy cow...I think my eyes would have bugged out of my head and I would have had to hold my tongue, lol. My daughter is 11,she is currently reading a book in 6th grade that she doesn't care for (in fact neither did I back then) but instead of letting her skim it i told her she should take the time and read it,because even though she may not like it may broaden her interests. I don't think your sell out by the way.Your just are trying to get some type of discussion going in class even if it is just scrapping the surface.Good luck with getting your class to read. All I have to say is that I hope none of your students go to nursing school. At orientation they assigned us over 100 pages of reading and every test has at least 200 pages of reading. From science textbook. At least the books you read in English class tell a story. OH my goodness! I would have been so angry at that mom! I wasn't a fan of reading when I was younger, but still read my books for class because it was my 'job' When yours student your 'job' is to study and read. But then I found the Goosbump books and fell in love with reading and it has stayed with me. I even learned to enjoy the books I was reading for class and still have the classics sitting on my bookshelf now. My 16 month old knows what her books are, she sits with us to 'read,' and I figure it's a start. If she doesn't like reading when she's older, I will still make sure she does for school since that's what she is there to do. My brother hated and still hates to read. But my parents worked and worked with him to make sure he read what needed to be read for school. Sure my mom probably would have wanted an 'easier' way to get him to do his work instead of sitting with him and asking him questions and making him to separate book reports, but that was her job as his parent and his job as the student. Hang in there!! I admire you for being such a dedicated teacher!! I love to read and my goodreads list keeps growing by the minute. I try to read a book every week or two but life is getting in the way - but I'm hoping to change that soon! We read at our house. I may not read the classics like I probably should and I don't read the same things Ry does, but we all read. We read to our kids and they love books too. If my voice could hold out I think my daughter would have me read to her all day long. It is a priority in our family. On a different note...I read your blog all the time but don't ever comment. I love your blog and guess I should comment more so you know it is loved. I love to read...when it is not assigned. There is something about a book that I HAVE to read. It makes it less interesting for some reason. But I admire that you desire the enjoyment of reading for your students! One day they will come around! You're my kind of teacher. Reading, although super fun, is also super important and I can't believe the parent of your student is so ridiculous to think that her son is just going to make it through life without having to grasp the concept of reading or reading comprehension. Maybe I need to read more about run on sentences. Anyway, people who say reading is boring just haven't read the right book. That's my theory at least. I mean, who likes to read required reading? No one. But when you get swept into a wonderful story... THAT's reading! Way to be an awesome teacher Bon, I hope you continue to push your kids into reading because one day one of them may take you up on it and their lives will forever be changed. mothers like that make me incredibly angry. theyre probably the type that will buy trophies for every kid at a competition so they all feel like winners. i mean really. we're teaching kids that their negative opinions are what matters and that they are allowed to quit because it doesnt suit them. ugh. i'm in a rage. I LOVE to read! It is one of my favorite things! I actually had the best day because I had a $25 gift cert to Barnes and Noble and was just so excited to go "hang out" around books, I love books! THEN even more excited because they had a sale on best sellers hardbacks, for under $7!!! I bought four books and am so excited I have a stock to last a lil bit, but they only last a little bit because I read everyday on my lunch break, and most nights before bed, meaning most books only last 3 weeks or so depending on how long they are. I can understand not enjoying it I guess, I just love the stories I get to live out while reading and that is also why I love tv and movies, which a lot of avid readers dont, but I do because I just love listening to stories if I am reading or watching more then anything! My jaw dropped close to five times while reading this post. I completely agree with you; I find this issue as incredulous as you do. I have been a voracious bookworm my entire life: I taught myself to read when I was three or four so I could do more than just look at the pictures in magazines, and haven't put down a book since, practically. To date, I own almost 300 books. So to hear that kids these days (adults too aparently!) "don't read" is appalling. Growing up with parents who gave me dictionaries and huge chapter books for my birthdays growing up, it's incredulous that this mother of your student is letting him off the hook of reading. I love reading...I wish I could read more than I do know, but when I was younger I was a book sucker. Parents...I'm not a parent yet but seriously I think parents should go to rehab or some educational class. Not all of them of course but most of "modern" parents should go because the absolutly missunderstood the concept of "Education". Expecting to read more from you!! Wow. I hadn't thought about it before - like most of the people here, or in Blogdom in general, I have a passionate affinity for the written word - but all of us who grew up with "look it up" meaning "go get a book" might have to start squaring with the fact that the world has changed shape again, and this time it's got autocorrect and Wikipedia. People growing up with that are not coming from the same place we are. It hurts - hurts our hearts, and hurts our culture - that even as a more abstract, optional sort of art form, writing/reading is becoming less and less appreciated. The slipping standards of utilitiarian communication skills like vocabulary, proper spelling and grasp of grammar are something I cannot comment on without raising my blood pressure. Perhaps, if you can afford to extend yourself, you should seek to become a tutor or teach at a focus school of some kind - prep, private, magnet, etc. - because there are children (/parents) who do care, want to excel, and with whom discussions about To Kill A Mockingbird are not out of the question! And it *will* get you down, years in the public education mill with teachers and students competing in apathy. It would be a selfish move, but I vote you seek out those venues where the love of learning is still the motivator! It'll be better for your autodidactic soul. It's a form of self-care; martyring yourself to benefit the few gems in each year is a hard life...I watched my mother do it, and although I admired it, I don't recommend it. No, I don't think you are old fashioned. I think you are great and doing exactly what teachers are SUPPOSED to be doing. Which is not raising children for other people, but TEACHING. The other day I substituted at our local middle school,and chided a student for pulling his phone out to see what time it was, when there is a perfectly good clock at the back of the room. And he says "I can't tell time on that thing." Are you kidding me?! Ugh! I'm so sorry you are having to deal with it so much more closely than the rest of us. It's very frustrating. And yes, I LOVE to read. I've always loved to read and never understood people who don't. It completely baffles me that my kindergarteners seem to get annoyed at me when I read to them! What the heck is wrong with the world when kids are complaining about being read to now? Maybe try to get your kids to listen to the book on tape! My husband won't read books all that quickly, but if he has the audiobook he will listen to it no matter what he's doing and gets so much more engrossed. Oh man this is a toughie (is that a word? HA!). I agree with you!! I read to our girls all the time because I want them to WANT to read and know it's important. Reading SHOULD be a priority. But now I'm gonna turn around and be a hypocrite because I don't remember the last time I read a book myself... especially just to read one for pleasure. I'm glad that I was pushed to read in high school, but I'm just not wired to to want to read all of the time. My husband is, but it's just not my first go-to extra time activity. I do enjoy reading... when I remember to! Every once in a while I remember that I am 80% through a book, read for ten minutes, put it back down for another year. So this raises a debate that I've been thinking about for a long time. Are audio books cheating? Would you consider suggesting that to your students? I can get through an audio book in a week, when it takes me literally years to finish reading them with my eyes. I think it's my awful attention span, remember that in the MTC Bon? Hahaha. Anyway, think about the audio book dilemma. My mother was an English teacher turned elem. school librarian. And I'm a high school librarian, so of COURSE I love to read. It makes me incredibly said to see how many people don't read now. And I realize that there are some people who will NEVER love it. I mean, I love music, but I don't love to dance. I will NEVER love to dance. Just not my thing. So I understand that some people will never like reading. But I think we start at such an EARLY age saying, "Here! Reading is fun! Now I"m going to FORCE you to read this book you may hate!" and so they never have a real opportunity to fall in love with it. Then they get to us n high school and say, "I hate to read. Reading is stupid. Let's burn the books!" I HATED reading in high school. I never did the required readings. I took an AP English class my Junior year and was required to read 5 books over the summer. 5 books in 3 months? The audacity of those people! That kind of ruined me for reading for a long time. But over the past couple of years, I've really started to love reading again. It's such a fun way to just escape. I feel sad for people who say they hate reading now. I really want to "go back" and read all the great books I missed out on in high school, like "To Kill a Mockingbird" or "The Great Gatsby" or "Lord of the Flies" etc. Also...can I join your book club? That sounds AWESOME! Oh, and sorry for the novel of a comment! Sheesh. That is so sad, and totally the parents fault! I was grew up going to the library and reading and now that's what I do with my kids and they love it. Sure they love to read books on my iPad, but they appreciate going and sitting in the quiet library and pulling out all the different books. I love to read but as a college student it's hard to find time to read the books that I want to read and it kills me. I wish I could go back to my high school days where I wasn't constantly buried in a science textbook and had the freedom to read a good novel. I totally see where you're coming from though, I know have tons of classmates who "hate" reading but honestly I think it's because they didn't grow up with it. My mom read to me every night when I was a child and that's what got me to love books in the first place. It's a shame my generation doesn't appreciate the full value of books. I read a ton and love it! I read 3 books in the past week. I usually will read about 1 a week but if i have a few of the ones i put on hold from the library that come in at the same time then i read a lot. I would read even more if my dang library books would come in haha. I don't want to criticize your teaching because from other posts I know you are fabulous and one of the truly good ones but I say don't give in to them. That is as bad as that mother! Make them work require daily quizzes with a few questions that could sort out who actually read the reading material. I never liked all the books I had to read in English but a lot of them inspired me and caused me to read more. Not only did they help me to like more reading but they prepared me for life. In LIfe you have to read a lot, for work and for life to understand even your bills and then if you go to college and want to do well in your classes you have to read the textbook. You have the important job of not only teaching them about how incredible the written word is but also how to read for the rest of their lives. I am grateful now for my english teachers not backing down on how much we had to read and penalizing us if we did not. Although i did not like it that day, it have been important for my future success as a college student. keep your expectations up. Reading is important, you can't give in to them, please! I know you are an incredible teacher, and if anyone is going to help them it will be you! I think you're asking a very biased crowd here. Who comes to a blog if they don't like to read? Ha ha. Seriously though, I am an avid reader, and it pains me to hear about teens who don't love books. Is reading aloud an option in your classroom? How strict are the book lists that you can choose from? Can you maybe let the students be involved in picking what book you read? Are these suggestions useless or helpful?!? I love to read and the situations you described in this post shocked me. Especially about the mother. WOW. I read pretty fast and read about a book or two a week. I absolutely love rereading books, too. Sometimes you miss subtle things on the first read. All I have to say is those people are definitely missing out and they have no idea what they are missing. Holy camoles, I love to read! I don't know what is better for me than reading a good book in one day because it's just that good. My hubby misses me when I get immersed so on a book. But, it's a great way to escape. I only started loving to read in grade 9, and all because of a wonderful English teacher we had. She even lent us her books! I like the idea above to maybe have them select the book to read. There are so many books out there that could be more interesting than "Catcher in the Rye", maybe picking something from the past ten years might help. How strict is your school district or school? Would it be ok for them to even do an audio book and maybe try to read along? At least they would get the whole book, not just snippets. They could even download them to their ipods or something like that. If they have tablets, see if they want to download them that way from the library. That might help. I read all the time, and I am passing along my passion to my daughters. As someone else mentioned, what is going to happen to them when they enroll in an English course in college/university? Would that parent still come to the professor and ask if they could get away without reading the material? Also, in real life the majority of people will have to upgrade their skills and lots of reading is required then. What then? I agree that you should not give up. I just took an English course at college level, and he had a quiz each class that covered part of the book we were assigned to read. The quizzes were worth 15%, they could mean the difference between a C and a B. Could you do something like that? Easy questions, but only if you have read the material. So many adults don't read nowadays, it's really sad. I would love to join a book club, but life gets in the way for so many. I just prefer to make the time to read instead of just sitting in front of the computer (like I am now, hee hee). Keep up on hoping that they will change, but have hope that at least three or more of your students will appreciate your efforts. Is there any way you can change the curriculum!!!??? She had a "book library" in her classroom that had a HUGE range of books from all different interest levels. But the freedom to choose actually made EVERYONE in the class read and love it. Reading is amazing!!! I love to read!! Not only is it a de-stresser, but it also helps us gain knowledge and progress. President Hinckley always said to be constantly learning and an easy way to do that is to read everything you get your hands on!! Reading is not old-fashioned. Keep trying to teach your students to read, you will not regret it. This is something I am SO passionate about. I'm even in grad school now to be an English teacher. I think reading is incredibly important. Reading teaches us about life, it gives us new perspectives and new eyes. It teaches us to become better writers and better communicators, and let's face it, that's something our world DESPERATELY needs. I think reading is essential. Not everyone will love it and fully appreciate imagery and word choice and language like we will, but I also don't see how someone could be passionate about math or science, but it's still something I had to learn and something that benefits my life. I'm stunned at that woman didn't make her son read. STUNNED. I don't know what I would've done! I'd love to know how you handled that situation. Those are the sorts of things that make me nervous to teach. I read. I read all the time. I'm an English major for Pete's sake! I have waffled over being certified to be an educator as well because of this reason. I don't know if I have the patience to withstand attacks against my favorites, the friends that kept me going through school, and the materials that will help them later in life. That being said, as a college student with a blog, kids, a full time job, and a full-time volunteer program at my community theatre, occasionally even I don't have time to read a full text and give it the attention it needs. I have developed certain tactics (including SparkNotes, I hate to say) that earns me good grades in college and gives me a basic understanding of the material so that I can just move on to the next thing. I have officially become part of the problem myself. Life is becoming more and more hectic with each new invention and technological advance to make life more efficient. Reading a text is not efficient. Reading SparkNotes is more efficient. You see what I mean? I appreciate full texts and have a deep abiding love for literature but if it's not something that I want to read or have a preference for, then it's very hard to make myself focus. For instance, I despise Conrad's Heart of Darkness. Something about the entire work just puts me off and I have been taught it three times in classes. I have never read it in its entirety and yet have formulated a great understanding of the content, so well that I was able to share my knowledge with other students, with commendations from my professor. OK, I'm kind of rambling now. I don't really know what the point is except that SparkNotes do have a place, even for those of us who take delight in the written word. Not all of the students will like or appreciate the same prose, drama, and poetry and may need help in understanding or just skimming. Perhaps teaching them how to USE the SparkNotes will help you out in feeling better about it. I also think it's ridiculous that students somehow think they won't have to read at all. THAT'S where it becomes completely unacceptable. THAT is the fault of the parent(s) who are involved or maybe even not involved. There are no certain expectations one should have of a literature class and one of those is that they should expect literature. For pleasure and not for class, I read ALL THE TIME. I enjoy novels of varying difficulties, from YA to Vanity Fair (one of my favorites). I love to read...now; but, in high school, i never found myself interested in reading. I'm not sure if it was the fact of someone telling me what I HAD to read, or just that I was interested in other things. My senior English teacher gave us a list of books we could read for extra credit, and thus began my love for a good book. I know you can't test EVERY student on every different book, and you probably have a certain curriculum you have to follow, but sometimes letting them decide gives them a different approach to the idea of reading. I so agree with you: I believe reading is critical. I love reading and I love language. My mom is an educator and she actually doesn't read much either. She reads her Bible and she reads (voluntarily) for professional development, but that's about it. Ugh. I would not have been able to handle that mother. I understand that some people just can't get into reading - they don't have time or they just don't prefer it. But when they use their dislike and make it the excuse for others not having to do the REQUIRED WORK is just ridiculous. For the record, I absolutely love reading, I know plenty of others who do, and I know some who may not read often, but they see the absurdity of that mother's request when I mention it to them. So I suppose there's a bit of hope.